The archipelago of Madeira was populated by the Portuguese during the Discoveries historical period because of its strategic location along the coast of Africa. The islands served as a refueling station and a first stop from ships coming to Europe from India, Brazil and other Portuguese “Feitorias”. The weather and the fertile volcanic soil of the islands allowed the introduction of multiple species from overseas, one of those being the Banana Tree. The bananas produced in Madeira Island are relatively small but are considered to taste sweeter than bananas from other locations due to the concentration of their natural sugar. They are used in some of the local dishes, for example “Swordfish with bananas” (click here to view a photo). 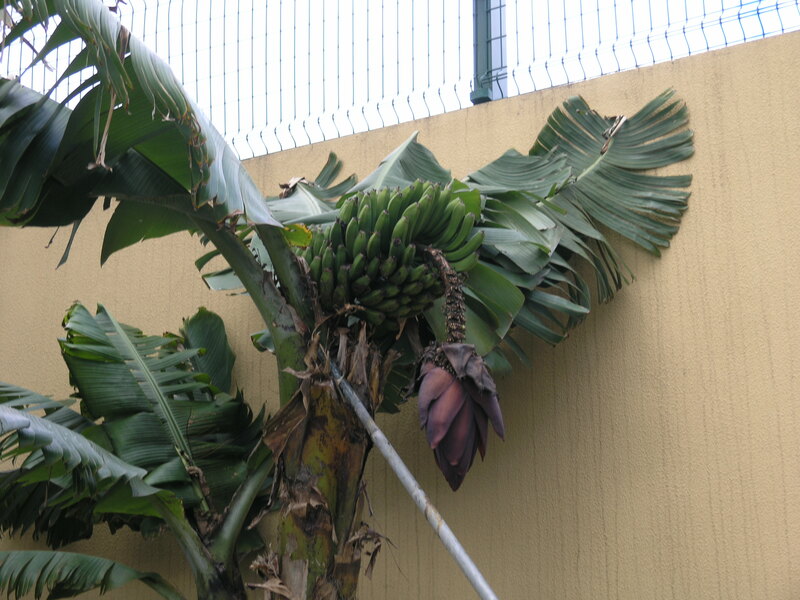 This is a photo from a Banana Tree near one of the Hotels in Madeira Island. The tree only produces one bunch at a time with its distinctive purple flower. When the flower withers and falls, the bunch can be cut off the tree because the bananas will keep maturating outside the tree. Note: For more info about Madeira Island check its category or the index page please.